Cape Verde, now known as Cabo Verde, is an archipelago of 10 islands, nine of which are inhabited. When the Portuguese arrived in 1462, they found no one living on the islands. 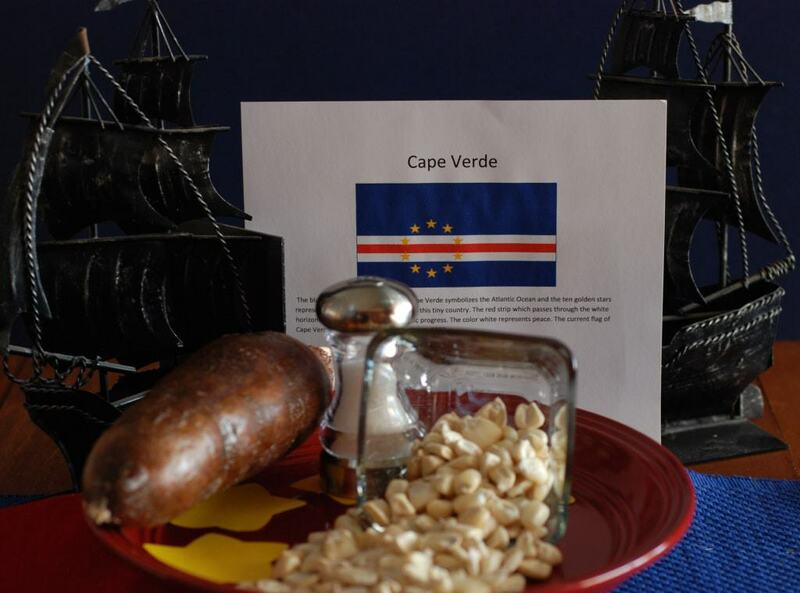 They first landed on the peninsula of the African mainland, which they named, Cape Verde, meaning Green Cape. Today the peninsula is called Cap-Vert, and the islands, which had been known as Cape Verde up until 2013, became Cabo Verde. Cabo Verde was under Portuguese rule for nearly 500 years. After a war was fought in Guinea –Bissau, with another Portuguese colony on the mainland in 1975, they gained independence. Today they enjoy a stable government and political system, which is a model for other West African countries that do not. African slaves were brought to the Islands by the Portuguese, to work on their plantations and to feed their sailors. The people are considered “Mesticos”, meaning, a mix of African and European origins. 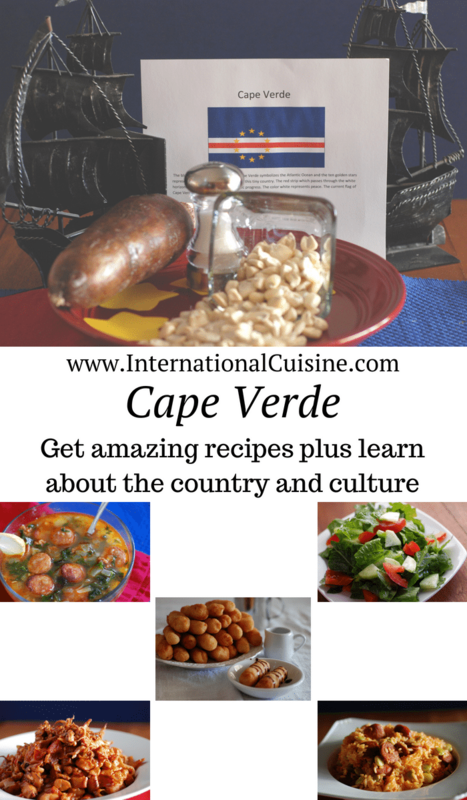 Although Portuguese is the official language, most there speak Cabo Verdean Creole, or Kriol. The Islands have few natural resources and they have suffered from extreme droughts and famine which resulted in massive emigration. There are more Cabo Verdeans living outside the country than inside. Nearly 500,000 Cabo Verdeans are estimated to live in New England, in the United States alone. Others emigrated to Portugal, Netherlands, France, Italy, Mexico, Spain, Canada, Argentina, Brazil. Many more fled to other West African Countries, especially those that speak Portuguese, like Angola and Guinea-Bissau. About 500,000 live on the Islands today with the majority living on the island of Santiago. Each Island has its own cultural identity, although the northern islands tend to associate with the Portuguese colonizers and the southern islands have a closer affinity with Africa. Each town has a Roman Catholic Church and Catholicism (infused with indigenous beliefs) is the main religion on the islands. Even so, most of the people are not practicing Catholics but they do celebrate numerous Saints’ days, where communities gather for parties and festivities with music, dancing, drinking and food. Cabo Verde offers free health care to its citizens. The facilities and resources are poor but they are more advanced than most other West African countries. They mainly suffer from infectious and parasitic diseases due to malnutrition and poor sanitation. Thankfully, they have not had any cases of the deadly Ebola outbreak, which is just off their shores. The average life expectancy is only 62 years of age. The economy there has gone through many ups and downs over the centuries. In the early days, they experienced many pirate raids and then the French also attacked there in 1712. In the 19th century they regained some wealth due to their strategic location on major trade routes between Europe, South America and Africa. For a time the Islands had a coal and submarine cable station and large salt flats. Later, severe drought and famine struck and it wasn’t until after World War II that they began to prosper once again. Many expats, living in other countries, send money “home”, which also helps with the overall economy. Today, they are working on becoming a tourist destination, with several luxury hotels built on the Islands. Most goods produced in Cabo Verde are based on agriculture, even though only 10 percent of the land is arable. About one-third of Cabo Verdeans are farmers. They produce bananas, corn, beans, sugarcane and coffee, but most of their food needs are imported. There is a large fishing trade as well. Many children follow in their parents’ footsteps and learn a craft at a very young age. People tend to work as long as they are able; it is not uncommon to see seniors working in the fields. 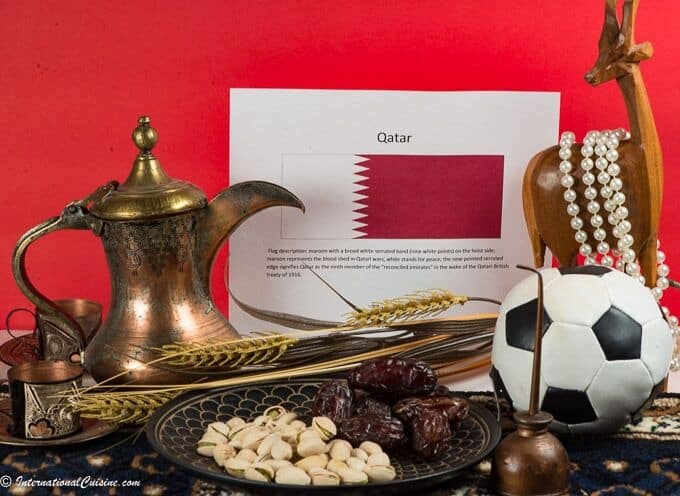 The cuisine, like the people, is a mix mainly of Portuguese and African influences. Of course being a nation of islands, fish and seafood play an important role in the diet. 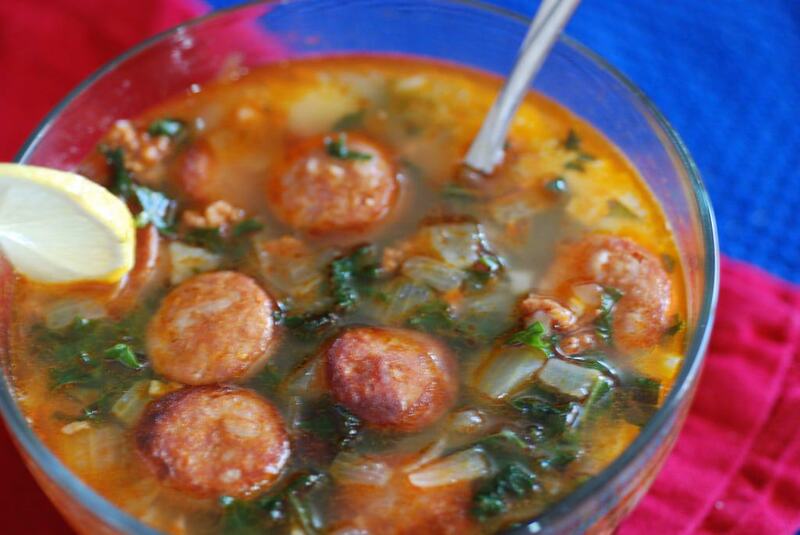 Their national dish is called Cachupa; a stew of hominy, beans, vegetables and whatever else is available to throw in. 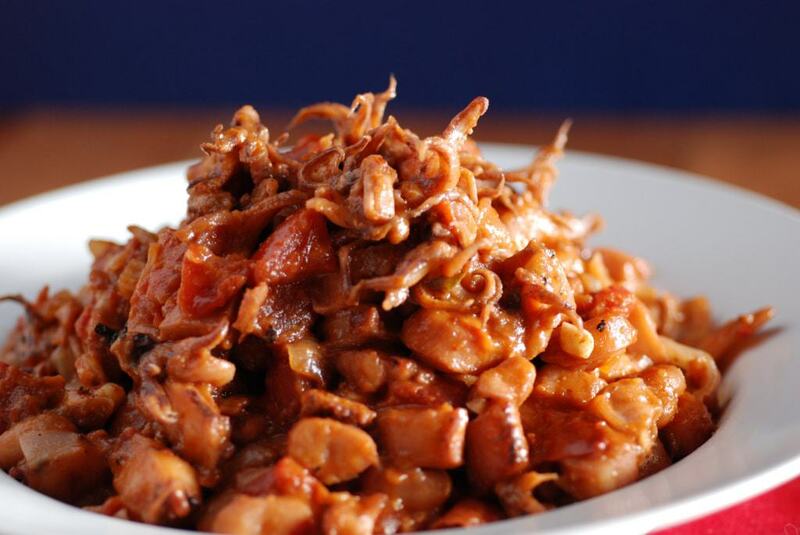 If it contains meat or fish, it is called Cachupa Rica. Breakfast usually consists of a steamed cornbread called cuscus, served with honey and coffee. The main meal of the day is a large lunch in the mid-afternoon, which is followed later by a light dinner. The drink of choice, particularly among men, is called Grogue; a liquor made of sugar cane. It is said it can make you go blind if you drink it long enough! We decorated our table with the colors of their flag. Red represents economic prosperity, white is for peace, blue is for the Atlantic Ocean that surrounds them, and ten yellow stars represent each of the islands that make up this tiny country. We put on some Cesaria Evora music. She is known as the Barefoot Diva and Queen of Cape Verdean music called Morna, a national song style like Tango is to Argentina. For the main menu, we had a delicious octopus stew that had a bit of kick due to the addition of the habanero pepper. But it really is true that the tomato tames some of the heat and it indeed worked beautifully in this dish. 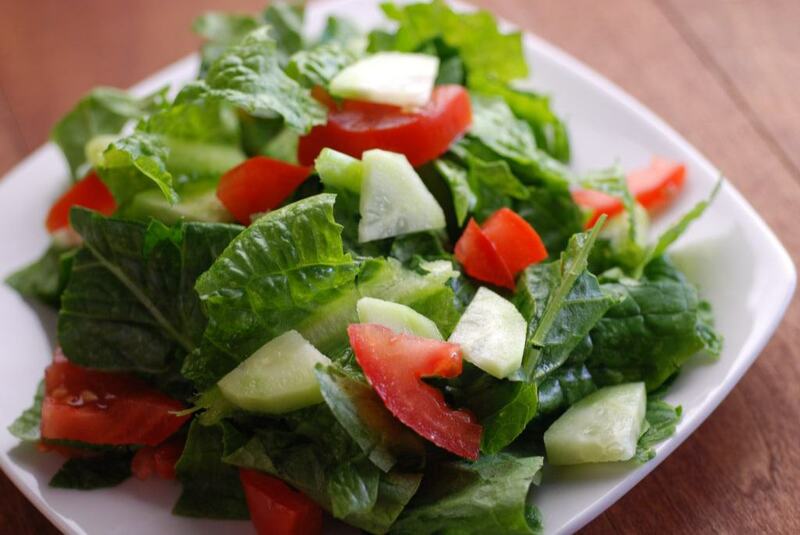 On the side we had a simple green salad; romaine lettuce with some cucumber and tomato, with just a light oil and vinegar dressing. 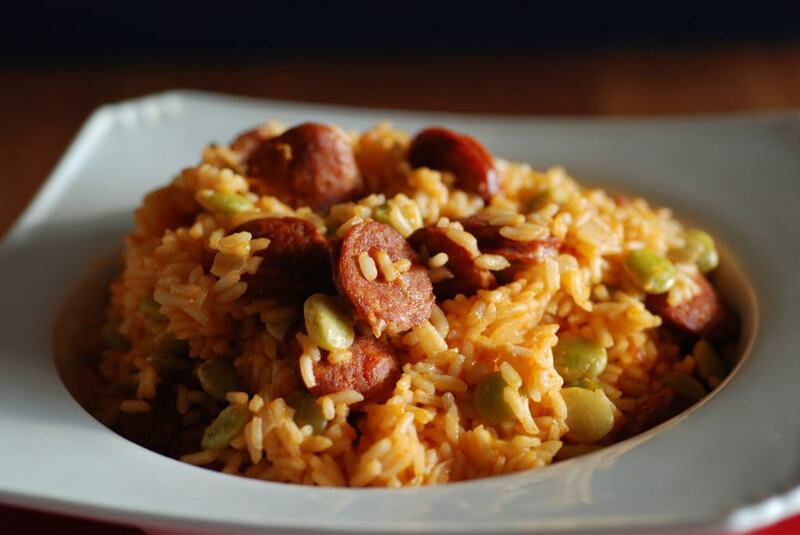 It was perfect along with what the locals call “Jag” Portuguese rice, with more of the Linguica sausage, YUM! For dessert we had what is called Gufong. 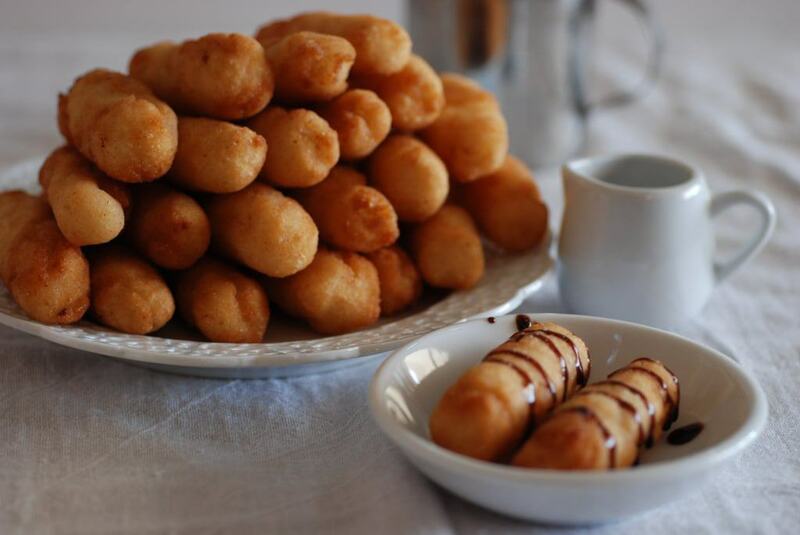 It is a simple fried dough on which we drizzled a touch of chocolate syrup. 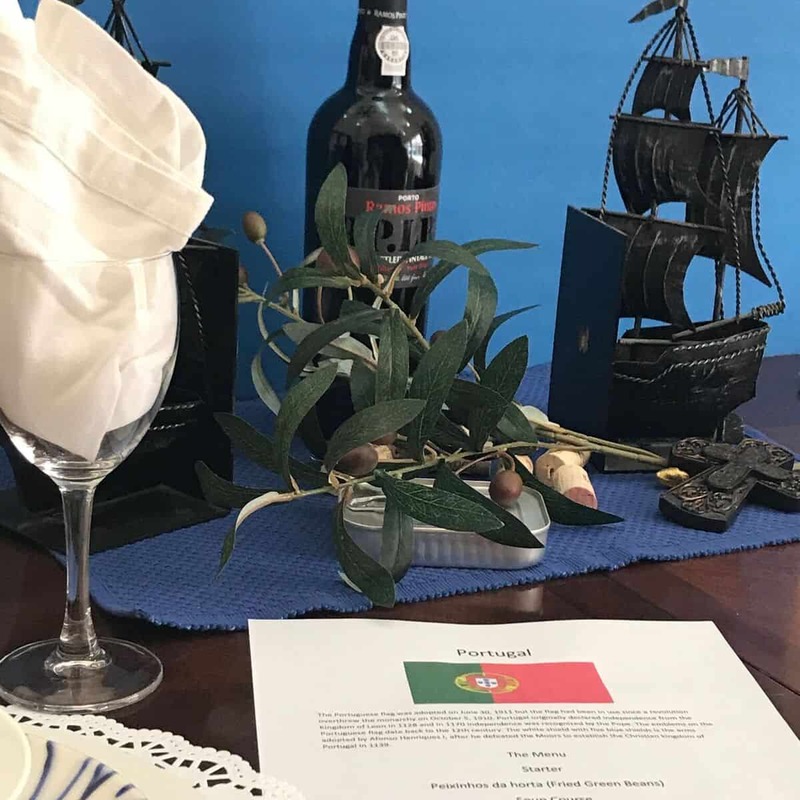 It was perfect, with a cup of tea to end our Cabo Verdean meal. The people of Cabo Verde are known to be very generous. It is considered rude to eat in public and not offer what you have to those around you. As a result, you won’t normally find them eating in public. They take pride in greeting each other with a handshake and a lengthy discussion about one’s family and health. This occurs every time you greet someone, even if it is twice in the same day. They like to be very physically close when they communicate and hand gestures are commonly used. Like so many other cultures, they show their generosity by providing a meal to a guest. If you ever are invited to dine there, be sure to take a gift to show your appreciation for their hospitality. As we say goodbye to these tropical islands called Cabo Verde, I leave you with a quote from a previous secretary of state. Perhaps lessons can be learned here. “Ti prosima vez!” Which means, until next time!